We printed out the word mat to help him look up words related to the book and placed it on his table to check out. We discussed the words, sounded them all out and pointed them out in the book. Afterwards we did some Trace The Words related to the story. The words were things like Witch, Wand and Broomstick. He didn’t need my help and was able to sound them out as he wrote each word out. He was very chuffed with his work and wanted to do more! Next was some addition using images related to the book. We counted the, up and wrote how many there were above them just to help with his writing as he went from being able to write numbers to forgetting some numbers in a short space of time so thought could help him doing this. This is additions of up to 20 but the highest answer was 11 so didn’t feel quiet like additions up to 20. He loved counting and adding with his and again very proud of his work. You can find loads of Room on the Broom themed worksheets and more on Twinkl. You can choose between free account, Gold account or Platinum. It certainly is worth it whether you’re kids are at school, a childminder, home educator or a teacher. Disclosure: I was given access to platinum account, some resources I may show on my blog are not accessible to free accounts. My opinions are unbiased. Many of you will know the troubles with my son’s school. Recently Ofsted posted a report earlier this month that was deeply depressing for me so I had begun to look in to Home Education. The amazing folks of Twinkl asked me if I would try out their premium package and over the new few months I will be posting Teaching With Twinkl And showing a little bit of what we have been doing. My son was very unwell on Sunday, boiling hot (38.7C is the highest I got with our cheap thermometer), floppy and complaining about his ears hurting. So Monday we saw the doctor and collected antibiotics and Calpol for an ear infection and to keep the fever down. So recently he has been off school but I didn’t want him to miss out on any learning and thought how could I make it fun? 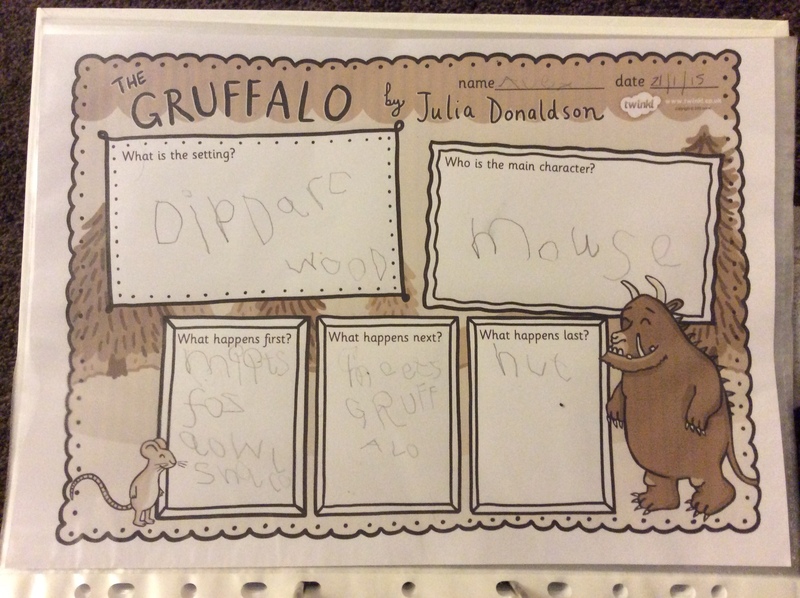 Currently he’s a big fan of The Gruffalo so printed a few Twinkl resources to do with the book. We read the book several times, watched the animated version and talked about each of the animals. He knew the owl was a kind of bird that flies and remembered where each animal lived and the order the mouse met them. So how else could I use his new found love for this story to continue teaching him? First I wanted to work on his writing. He is left handed and often he leaves a very faint line. Here he wrote inside the letters as he sounded them out and actually put pressure on to the pencil and I could actually see what he was writing! Still trying to help find ways to make it easier to write left handed as we are all right handed so very odd to teach with my right when he uses his left. Up next was a simple counting. He was still not very well so decided a simple counting would be good but also help him write his numbers. He did this so fast, this is early learning which is his level at school right now. Thought perhaps next time shall try something a little different. Addition was on the list the next day. Normally I use toy cars or Lego to help with addition and subtraction so this was a little different. But again he blew through this. 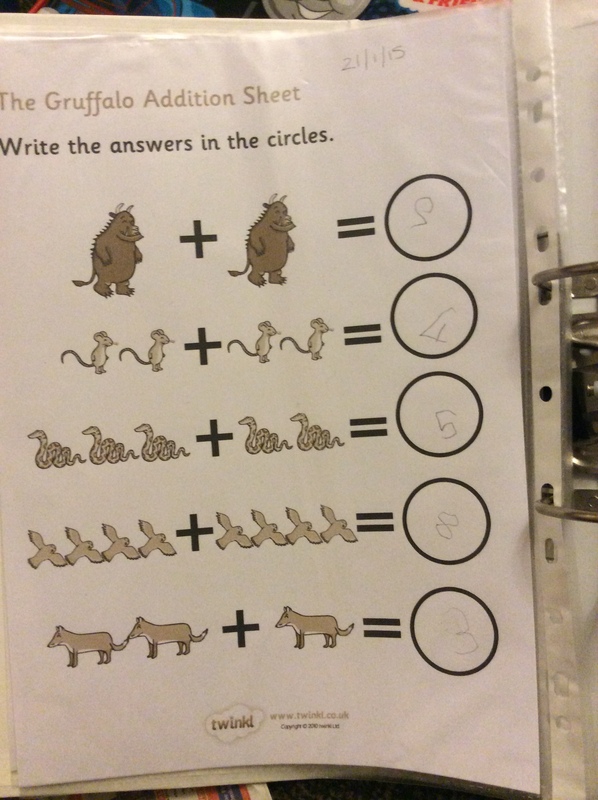 He only recounted the owls as he wasn’t sure he was right but he was correct with 8 and wrote it down. Finally we reviewed the book itself. 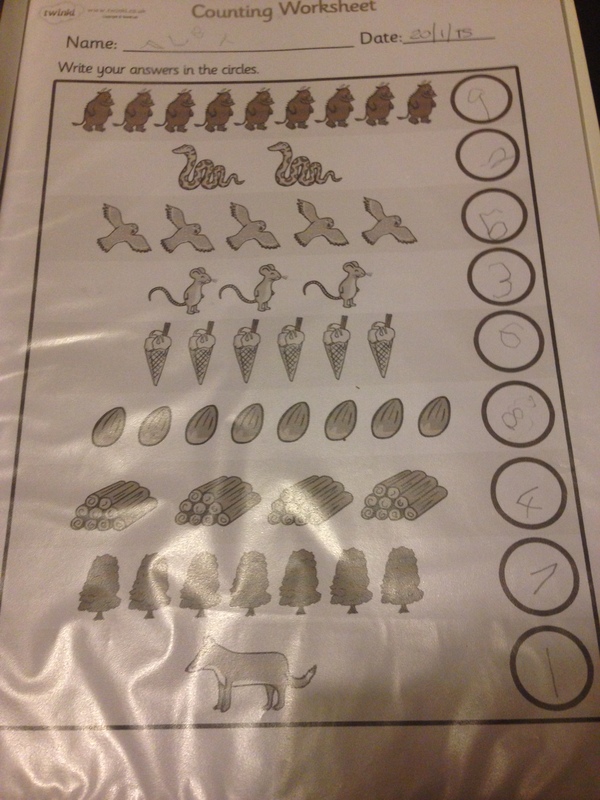 This was probably the hardest as he was still learning spelling and phonic sounds but he did pretty well. A few spelling errors but at this point. I’m just impressed he kept it up. He found the last part hard so we cut the story up in to three parts. 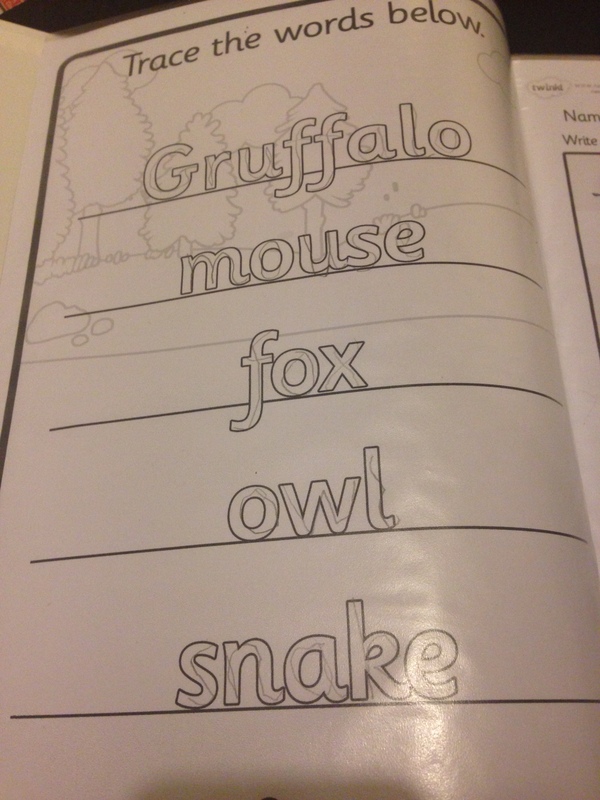 First is the mouse meets the fox, owl and snake, second part he meets the Gruffalo and shows the Gruffalo to the other animals. Finally he ends by scaring the Gruffalo and then enjoying a nut. He said “at the end he eated the nut” but then just wanted to write “nut”. My thoughts so far? Impressed! I was able to teach him addition, work on his pencil control and help with his literacy all through a story he is currently enjoying. I would never have thought of it myself! You can follow Twinkl on Facebook and Twitter, keep an eye open for offers and exciting new resources! You can join for free and use any free resources or consider their Gold or Platinum options. Disclaimer: I was given access to Platinum resources to review Twinkl. My opinions are my own and unbiased. Some of the Twinkl resources are free, but some may require a gold or premium account to access.